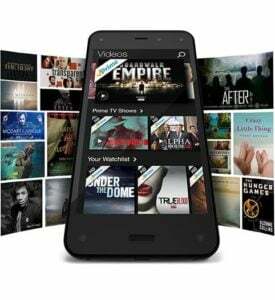 Amazon's Fire Phone has not been the hot seller the company hoped it would be, and there are several reasons for this including their exclusive partnership with AT&T at launch and some design/software flaws. That being said, the underlying hardware is still nothing to laugh at. The phone features a 2200 MHz Snapdragon 800 processor which is also found in last year's premium flagships including the Samsung Galaxy S4 and LG G2 to name a few. Also inside include 2 GB of RAM, a 2400 mAh battery and a camera that is 13mp with Optical Image Stabilization and backside illumination. Since this is an Amazon Fire Phone it does not contain the regular Android OS you may be used to, it runs a derivative of Android designed by Amazon and called Fire OS, and as a result of this OS the phone does not come with Google apps such as the play store, or G-mail installed. You can however side load some of these apps while others simply won't work without Google Play services and the Play Store installed. Although you can root the OS, it is still locked down pretty tight, as of yet no custom roms have been developed due to the locked bootloader. Now, if you are not a big user of Apps on your phone, the Fire Phone might suit you well. While it does include the Amazon app store, the number of apps in it pales in comparison to Google Play. Even when you can find the same apps in the Amazon Store as the Play Store you will often time find the apps aren't updated as quickly or frequently by the developers in the Amazon store as they are in the Play Store. With that being said, the current sale price of the unlocked GSM phone may be too hard for some of you to pass up. For $199 you get the phone, plus one year of Amazon Prime which includes two day shipping on products ordered through Amazon as well as unlimited streaming of TV shows, music, and movies. Amazon Prime by itself normally cost $99, so this phone is quite a bargain if you can live with some of it's drawbacks.